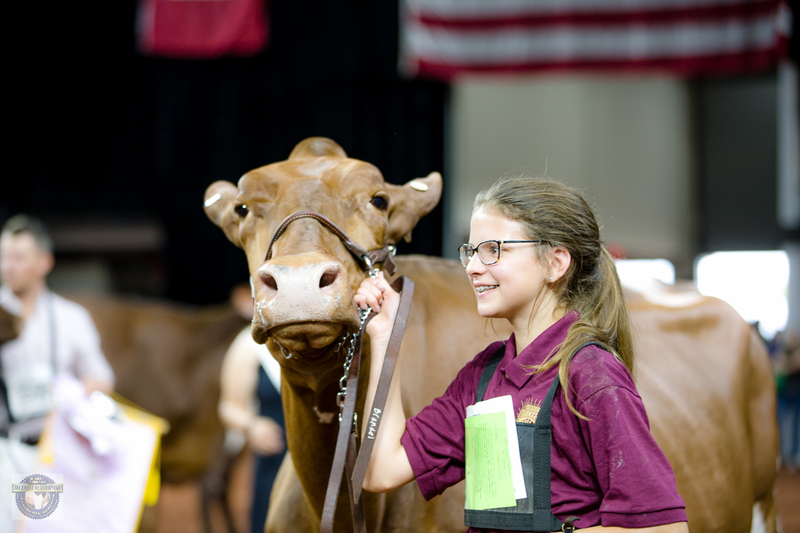 MADISON, Wis. — It’s not every day that a fifth grader garners grand champion with a junior 2-year-old at the World Dairy Expo, but that’s what Lake Mills, Wisconsin youth Ashley Brandel and her Maple Fudge of 12 Oaks did as first timers to the colored shavings in Madison, Wisconsin two years ago when they achieved their first win in the International Milking Shorthorn Junior Show. The dynamic duo repeated this performance last year in the International Milking Shorthorn Junior Show and three-peated again this year — with the added bonus of earning 2018 grand champion honors in the open competition as well. Now 12 and 4, Ashley and Fudge made memories in Madison last week — and a team of family and friends have been there to share the journey. “These two just know each other so well because they grew up together,” Tracy relates, confiding that she hopes Fudge can talk Ashley out of the teenage years. “There’s not much to get excited about in the dairy industry these days, but this is something to smile about,” said Ashley’s aunt, Cindy Krull-Begeman, part of the extended fan club shedding a few tears at ringside. In addition to leading ‘Fudgie’ to grand champion, Ashley could be found throughout the week taking care of her cow and others tied-in, and gaining confidence from the team of siblings and cousins around her. “My biggest focus is always trying to set her up as good as I can — and to keep her head up,” she says. A tall order, considering their difference in size, but one that Ashley handles like a pro. Fudge was Ashley’s first Milking Shorthorn purchased with her brother Colton as a baby calf from Mapleton Valley Farms, Oconomowoc, Wisconsin during the Wisconsin Dairyland Milking Shorthorn Sale more than four years ago. When Fudge calved for the first time on March 10, 2016, the team of family youth quickly realized she had something special. Sage words for a young lady who can’t help but impress with her focus in and out of the showring. Ashley and her brother Colton, 14, started their growing herd of Brand-New Milking Shorthorns four years ago. They use the Brand-New prefix also for the small herd of Holsteins they enjoyed showing, but wanted to branch out into another breed. “We told them to do the research and bring us their bullet points,” Tracy recalls. “We went to a few sales. Then we reached out to breeders as the kids decided what breed to branch into. The Agnew family at Mapleton Valley Farms has been wonderful in helping them get started in this breed.” They are the breeder behind Fudge and her dam. Ashley has been showing Fudge from spring calf at the county and state fairs to 4-year-old three-time World Dairy Expo champion cow. Not only did Fudge garner top cow of the junior and open Milking Shorthorn competition at the 2018 World Dairy Expo last week, she was supreme champion in August at the 2018 Wisconsin State Fair. Two years ago, Ashley and her brother owned eight Holstein cows and three Milking Shorthorn cows as well as eight Milking Shorthorn heifers. Those numbers have grown with their breeding decisions. Their Brand-New herd is part of Straussdale Holsteins, Lake Mills, Wisconsin, where their father Matt Brandel is in partnership with his uncle Jim and cousin Bruce Strauss. The 230 registered Holsteins are known for quality with a rolling herd average of 27,500M 3.8F and 3.1P with somatic cell counts consistently below 100,000. For Ashley, the unexpected high-point came early — due in part to having a Milking Shorthorn that breaks the mold and in part to Ashley’s own obvious work ethic. Good advice that she followed. She could be found in coveralls bedding and grooming and cleaning their area of the show barn just hours before the pageant. With the Milking Shorthorn breed have come opportunities for youth like Ashley and Colton to learn and use genetic tools through the genetic expansion. They each have a foundation cow in their Brand-New herd and had decided on this breed because of their high standing in fertility and good feet and legs, according to Tracy who notes that the Milking Shorthorns are also an approachable breed for young people getting started. The Milking Shorthorn breed standards have largely embraced a form of genetic expansion in an effort to continue genetic improvement that avoids inbreeding concerns, yielding dramatic improvement in both production and dairy conformation over the past 30 years, while retaining a breed identity, according to the American Milking Shorthorn Society. Fudge is in her third lactation, with previous lactations well over 25,000 pounds. She had her third calf, Frannie, in June, and Ashley relied on Udder Comfort to get that silky, milky udder ready for the fair in August and World Dairy Expo in October. The Brandel, Strauss, Krull and Brandenburg families have been using Udder Comfort a long time — not only at the shows, but also at home in preparing fresh udders for lactation. Ashley and Colton’s younger siblings Katie, 10, and Justin, 9, are getting involved in junior activities too, and ahead of the four Brandel children are their Strauss and Krull cousins, and their friends and mentors in the Brandenburg, Hildebrandt and Emery families. When they are all together, there’s a lot of excitement. Some enjoy the showing, others enjoy the clipping and preparing of cattle for show, and the results speak for themselves as they do well at the county and state fairs while caring for a large string of cattle. Some have also branched into showing market livestock and doing equine events. “When we step back and look at what they do, it’s pretty cool. They are hands-on and the older ones help the younger ones learn. There’s all kinds of teamwork going on,” says Cindy Krull-Begeman. And at every level, they have some pretty awesome role models. Most of the gang at the Jefferson County fair, Summer 2017 (back l-r) Olivia Brandenburg, Mariah Strauss, Carley Krull, Colton Brandel, Carly Strauss, Noah Heise, (middle l-r) Sawyer Brandenburg, Kenzie Emery, Erin Strauss, Emily Strauss, Brynn Emery, (front l-r) Emerson Brandenburg, Owen Strauss, Ian Emery.